The U.S. bank prime rate was unchanged in the second half of March. During its March meeting, the Federal Open Market Committee reiterated its commitment to keeping interest rates low until the economy shows sustained signs of stronger growth, so it is unlikely the prime rate will change any time soon. Credit card rates can change without any change in the prime rate, but all the credit card offers tracked by this survey went the entire month of March without any changes. The stable credit card environment was in contrast to the latest in what has become a long line of international banking crises. The most recent episode involved the island of Cyprus -- a very small economy in global terms, but one with a disproportionately large banking system due to its popularity as an offshore haven for foreign investors, especially wealthy Russians. The problems in Cyprus were part of the fallout from the earlier Greek sovereign debt defaults, and it still remains to be seen whether, when, and where the next domino may fall. All of this has the potential to matter to U.S. consumers simply because the global banking system is so interconnected. If bad debts suddenly create a shortage of capital, it could make credit everywhere harder to come by and/or more expensive. On the other hand, it is significant to note that most of the banking crises that keep cropping up have been caused by bad investments rather than by consumer credit failures. The mortgage crisis was a notable exception, but the worst of that seems to be over. In short, problems like the banking crisis in Cyprus could yet trigger a credit crunch in the U.S., but for the time being, credit card companies should continue to find American consumers a relatively good risk in a troubled global investment environment. Although there have been no recent changes in consumer credit card offers, people should be aware that there are still substantial differences in rates from one card to another. Even at the lowest rate tier, there are differences in excess of ten full percentage points between the cheapest and most expensive rates offered. 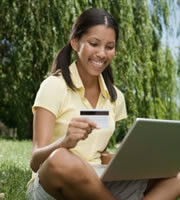 Therefore, even in an unchanging market, customers would be well advised to shop around for better offers. Parents with students off at college in the middle of spring semester can rest easy knowing that the student credit card rate environment has been stable lately. Still, parents should be vigilant about checking in on their children's credit card use, to make sure they are developing responsible payment habits and not running up large balances during spring break or any other time. With no changes in business credit card rates over the past month, corporate card managers can look at this environment in two ways. On the one hand, change can create the opportunity to find cheaper rates, so the recent environment may be marked by a lack of new opportunities. On the other hand, stability is conducive to careful research, so this may be a good time to compare rates and evaluate the cost/benefit of rewards programs. The difference in the typical credit card rate charged to consumers with excellent credit and the typical rate charged to those with average credit remained at 4.00 percent. This rate differential should be an incentive for consumers with flawed credit to improve their credit ratings in order to obtain cheaper credit card rates. 0 Responses to "Credit card companies hold rates steady despite the latest banking crisis"